The MOD switch was built with the keyboard community in mind. The switch was designed by the community. 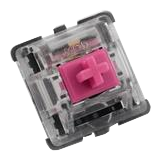 An ergo clear switch consists of using either a Cherry Brown or Cherry Red weighted spring in a Cherry Clear switch, a tactile touch switch with a larger bump than the Cherry Brown. We eliminated everything in between and have provided such a switch without the repetitive task. The switch is lubricated on the the side of the sliders for more smooth and less scratchy feeling. These switches are a hybrid between Cherry Brown and Cherry Clear switches. They are perfect for the light typists who crave that tactile bump.